CARADH O’Donovan won a first national title at the weight she hopes will carry her to the Tokyo Olympics in karate, the -61kg, over the weekend, following earlier Irish national wins at a lower weight category. The change in weight is designed to increase the Terenure woman’s chances of qualifying for the Olympics in two years time, and represents astonishingly smooth progress, given karate has only been the 33 year old’s main sport since last year. O’Donovan switched from an acclaimed and successful career in kickboxing to pursue a lifelong Olympic dream that she has accepted won’t happen in kickboxing during her competitive lifetime. 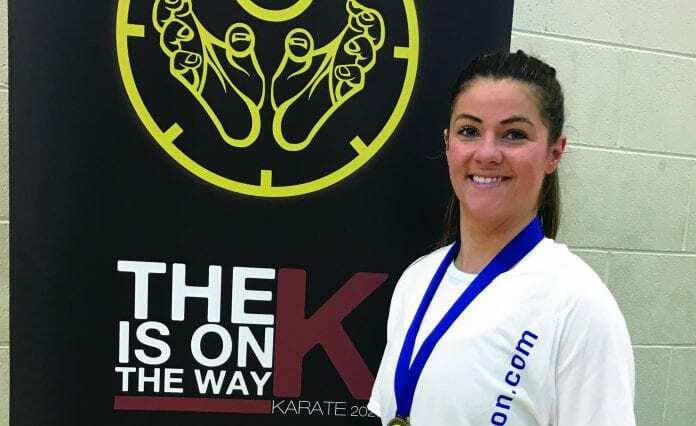 “This is my second national title in karate but it’s my first since I’ve decided to move up to a heavier weight category,” O’Donovan told the Dublin Gazette of her national level victory on Saturday. “I made the decision to move up as there are more places available for the Olympics at this weight. O’Donovan is currently running a crowdfunding campaign through which she’s aiming to raise €10,000 to help her in her charge for Tokyo. In her campaign, she highlights why she’s not expecting to get any Olympics funding, for reasons ranging from her age to an ongoing battle with Crohn’s disease. She accepts that on the face of it she might look like a less than ideal candidate. Nevertheless, she believes she’s a serious contender. “It’s been my dream since I’ve been a child to win an Olympic medal and at my age the only way to do this is to switch sports,” she explains in her campaign. “Kickboxing is not an Olympic sport and so I’ve decided to start a new sport that has just been included in the games, karate, which is very similar. “After a couple of months training in karate, I won the senior national championships and I have represented Ireland at the highest level internationally, where I was narrowly beaten by the overall winners. “I’m making fast progress. I’m now looking forward to being selected for the European and World Championships this year. To reach the Olympics, I need to travel to a lot of other international competitions in order to build up my ranking points. ** You can find O’Donovan’s funding campaign at www.gofundme.com/caradhs-olympic-dream.